Portal 2 is no Portal. Let’s get that clear from the outset. The original Portal was as close to flawless as any game has come. It introduced a central mechanic of genius-level proportions, it was clever, and it was funny, and it was perfectly paced. Portal 2 is its own game, and it doesn’t try to recapture the magic that Portal bottled back in 2007. Instead it tries to take some of that magic and push it in a different direction. It’s not the small, minimalist experiment of Portal, but it does introduce new mechanics, new characters, and a new look at the world of Aperture Science. When taken on its own terms it’s a rather special game, but it does still fall, however unfairly, somewhat into the shadow of Portal. while there are lasers and turrets and pressure plates, the Portal Gun is your bread and butter. – The original Portal saw the player taking on the role of Chell: a test subject in Aperture Science’s Enrichment Centre, tasked with trying out the Portal Gun by traversing various test chambers, solving various puzzles, bridging impassable pits, avoiding (adorable) automated turrets, and generally trying to survive. Throughout the game the AI watching over your activities, GLaDOS, becomes more and more unhinged (think 2001: A Space Odyssey‘s HAL 9000), and it eventually becomes clear that in order to escape the facility you’ll need to shut her down. At the end of the game you succeed in destroying GLaDOS’s systems, but are ultimately dragged back into the facility to who knows what fate. Portal 2 begins with you waking up after years, perhaps decades, perhaps centuries, of suspended animation back in the Aperture Science facility. And after that…well, actually no. No. I’m not going to say anything about what happens in the story apart from this: GLaDOS isn’t quite dead, and you’ll end up seeing a lot more of Aperture Science, and its troubled past, this time around. I don’t want to say anything about the story because a great pleasure, perhaps the chief pleasure, of Portal 2 can be found in being swept along with its twists and turns. Its surprises, and even the things that aren’t really surprises, are best approached without any prior knowledge of the game itself. So, I’ll try to talk about why the story is good without talking about the story. Which could be interesting. Although Chell is a silent protagonist there is a lot of talking in the game. Far more talking than in the original Portal, and it’s clear that this was a big focus for the sequel – while Portal had a brilliantly minimal story, Portal 2 is deliberately far more fleshed out. And it works extremely well. Valve (the developers of the Portal games) has a fantastic team of writers, and Portal 2 is an extremely funny game. It’s probably the funniest game I’ve ever played, even though it’s not an out-and-out comedy. But despite the comedic nature of much of the writing it’s also quite dark, and even a little poignant at times. I can’t really say more without getting into specifics of the plot, but it’s a clever, clever script, and there are countless moments where someone says something amazing, or where something really special happens – the beginning and end sections stand out especially (Best Opening of 2011 and Best Ending of 2011). Dialogue is superbly-written, the cast does a great job with the material, and there’s an undeniable sense of timing underlying the whole game. It’s a game with a hell of a lot of thought, and a hell of a lot of love, poured into the writing and the atmosphere, and all of it just works without a hitch. Just standing around looking at the sights can often reveal tiny little details that show off just how much imagination has gone into the game. I really just don’t have anything bad to say about the writing or the atmosphere – I enjoyed inhabiting the world of Aperture Science immensely. Where the game is less than perfect,however, is in its puzzles. Portal 2 is as much a puzzle game as it is a story-driven game, though unlike the original Portal I don’t think it’s any more a puzzle game than a story-driven one. But that still leaves a lot of room for the puzzles. Though a fair bit of your time will be taken up by the running around and general exploration of Aperture Laboratories, you’ll often run into roadblocks that require the clever use of your Portal Gun, and other ancillary mechanics, before you can proceed. The standard features are back from the first game – pressure plates that control doors and weighted cubes to place on them, turrets that lock onto you and try to kill you if you run into their line of sight, moving platforms, and a handful of others. And many new mechanics are gradually introduced throughout the game. One of the first of these are Hard Light Bridges: solid beams of light that extend indefinitely from their source, going through any portal you place, until they hit a solid object. There are also lasers, cubes for redirecting lasers, tractor beams, and three different types of gels that have various effects on the surfaces they coat. The Repulsion Gel causes any surface to become improbably springy; allowing the player to bounce to great heights. The Propulsion Gel allows the player to move incredibly quickly over any surface the gel coats. And finally, the Conversion Gel, on which the player can create portals even when the gel is covering surfaces that usually do not allow portals to be placed. All these various mechanics are used in puzzles on their own at first, and then later mixed in with one another – interacting in novel and interesting ways as the puzzles gradually increase in complexity. As brain-bending puzzles go, the puzzles in Portal 2 are really, astonishingly good. In general they require understanding and clever use of the overlaping mechanics (one basic puzzle might, for instance, require that you use Repulsion Gel to propel yourself into the air, and then fire a portal into the correct position to redirect a light bridge so that it catches your fall). But though these puzzles work well and are mostly satisfying there’s two niggling problems that continue to crop up throughout the game. The first is that there’s mostly only one correct way to solve the puzzles. Now, there’s nothing inherently wrong with puzzles with only one solution, but when you’re handed a mechanic as ingenious as the Portal Gun it’s just slightly disappointing that there’s no real freedom. Though the artificial, linear nature of the test chambers is understandable, often enough you’ll be outside the test chambers running around some other part of Aperture Laboratories, and yet the problems are still artificial, and still only have one correct solution. It really is missing a trick – while Portal 2 is just about hand-eye coordination and problem-solving, it could have also presented you with puzzles that push you towards creative and jury-rigged solutions. When you have a mechanic like the Portal Gun the possibilities for building puzzles that have many, many solutions are endless, and this seems to me to be the most interesting possibility presented by the Portal Gun mechanic. But this isn’t realised, and for the most part the game’s content to present you with problems in the way many other puzzle games do. Of course, the exact nature of the puzzles is very different in Portal 2, and the puzzles themselves are of a far higher standard than most other puzzle games. But there’s still cause for disappointment because Portal 2 isn’t trying to do anything spectacularly new, even though it so clearly could. The second problem is that, while most puzzles are so well-made that you’ll rarely be stumped for long, frustrating periods of time, every so often a puzzle has such a specific solution that it’s really very easy to overlook it. And when this happens there’s not really much to be done – the solution is sometimes staring you in the face, sometimes hiding obscurely behind something you generally wouldn’t think to do – and you’ll just run around for a while completely at a loss. Sure, this is how puzzles often work – either you get them or you don’t, but because there’s very rarely any possibility of creatively solving puzzles, and because the puzzles can get so complex – with several interlinking mechanics – it can get to the point where no progress can be made until you notice one little thing you’ve been overlooking that is Vitally Important for the current situation. Usually solving a puzzle in Portal 2 is hugely satisfying, but when, after a good ten minutes of walking round in circles, you’ve finally noticed that you need to look there and shoot a portal exactly there it’s more frustrating than anything. 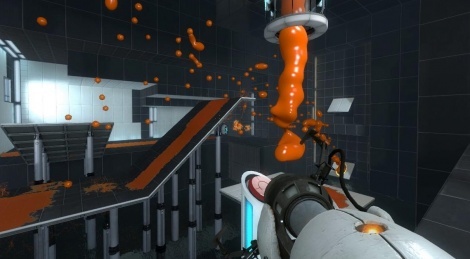 It’s not often a problem – Valve is especially good at building smart puzzles – but it does crop up a good few times, and certainly many more times in the original Portal. This is because the original game was very tight – it had only a few main mechanics, and it played around with them a lot, whilst Portal 2 has a lot of mechanics and often brings many of them together. So sometimes Portal 2 gets too specific, and too narrow for its own good. And in a way that’s understandable, and often forgiveable, but while the increased complexity of Portal 2 does help to make it a powerfully interesting puzzle game in its own right the comparative simplicity of Portal means that it’s a better, in a way purer, game experience. That’s not to diminish Portal 2‘s achievements: this is a game with often-spectacular puzzles, and when you combine that with the clever, funny, and satisfying story that comes along with this it’s certainly a huge achievement. It’s one of my favourite games of the year, and for good reason. But I just can’t think about it without wondering what a more free-form, creative puzzle game it could have been if it had only tried. That slight disappointment stuck with me, and I worry that Portal 2 might not have learned the best lessons from the brilliance of Portal. That game often inspired creative solutions to puzzles, even if there were only ever very few solutions for any given problem – there was a higher proportion of eureka moments to oh, I understand now moments compared to this game. And while Portal 2 had more great puzzles, more fantastic little set-pieces, and far more well-written dialogue than I care to mention that unsettling comparison with its predecessor still hovers uncomfortably. and as I said, perhaps a little unfairly, above it. This entry was posted in Games Blather and tagged Games of 2011, Portal, Portal 2, Review, Valve. Bookmark the permalink.